Comet 22P/Kopff is too faint for observation. An analysis of the data gives a light curve of 7.5 + 5 log d + 10 log r, but this is very indeterminate. Observations in ICQ format reported to October 30 (last observation) . Comet 57P/du Toit-Neujmin-Delporte is too faint for observation. Comet 65P/Gunn is too faint for observation. 1996 B2 Hyakutake is now too faint for observation. The light curve fits 5.4 + 5 log d + 7.5 log r quite well. A report on the comet was published in the BAA Journal and as a special edition of The Astronomer magazine. Observations in ICQ format reported to 1996 August 24 (last observation) (100kb). 1996 E1 NEAT was discovered by the Near Earth Asteroid Tracking team. It is too faint for observation. 1996 F1 = 125P/Spacewatch has been recovered, but it will not be bright enough for visual observation. 1996 N1 Brewington A new comet, found by Howard Brewington of Cloudcroft, New Mexico. The observations fit a light curve of 8.5 + 5 log d + 13.5 log r, but it seems to have outburst prior to perihelion as it should have been brighter at discovery if this magnitude law applied. 1996 N2 = 133P/Elst-Pizzaro An unusual cometary object in an orbit resembling that of a main belt asteroid. It was too faint for visual observation at around 17th mag. A thin tail meant that it must be classed as a comet, and this seems to have been produced in a recent outburst. Observations in 1997 October showed it to be completely stellar to 21st mag, suggesting that the tail might have been a collisional by-product of an asteroid impact. Further observations linked the object to an asteroid seen at previous apparitions and it was given both a cometary and asteroidal designation. Another intersting object, is asteroid 1996 PW. This is in a cometary orbit, which extends well beyond that of Pluto, but it shows no sign of any cometary activity. 1996 P1 = 126P/IRAS Was recovered by Rob McNaught at 13 mag, but has now faded below 13th mag. 1996 P2 Russell-Watson Ken Russell discovered this 13th mag comet on a UK Schmidt plate taken by Fred Watson. It is now too faint for observation. Several people have noted the similarity of the orbit to that of P/Shoemaker 4 (1994 J3) and it may be of short period. 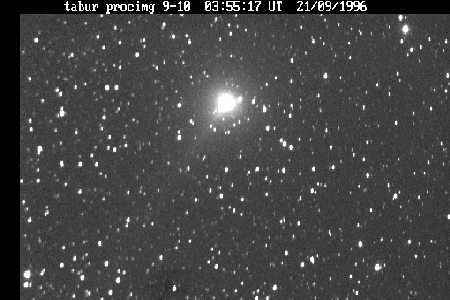 1996 Q1 Tabur Discovered by an Australian amateur Vello Tabur. The orbit is very similar to that of comet Liller 1988 A1, which reached perihelion on 1988 Mar 31. It seems likely that the two comets separated at their last perihelion passage, about 2900 years ago. After reaching naked eye brightness in mid October, the comet suddenly faded dramatically and is no longer visible. This image by Denis Buczynski shows how the comet appeared in a CCD camera before the fade. It appeared to have a short anti-tail when it passed through the nodal plane. Observations in ICQ format reported to 1996 November 10 (last observation). 1996 R1 Hergenrother-Spahr 1996 R1 is a new comet, but is now too faint for obervation. 1996 R2 P/Lagerkvist A 17th magnitude comet has been discovered on a schmidt plate by Claes Ingvar Lagerkvist. It is a faint periodic comet and is unlikely to be observed visually. Calculations by Kazuo Kinoshita reveal that it passed extremely close to Jupiter in 1987, down to 0.0057 A.U. This dramatically reduced the perihelion distance from 5.5 A.U. down to 2.6 A.U. When it came to close to the sun for the first time in 1996, it brightened temporarily up to 16.5 mag in an unusual outburst, and it was discovered. However, it quickly returned to the original extremely faint state, fainter than 20 mag. 1996 R3 Lagerkvist The comet was finally named in November 2004, following detective work by Maik Meyer, which allowed an improved orbit to be determined. 1996 S1 = 127P/Holt-Olmstead Jim Scotti has recovered this periodic comet with the University of Arizona Spacewatch Telescope on Kitt Peak. It is too faint for visual observation. 1996 S2 = 128P/Shoemaker-Holt 1 Jim Scotti has recovered this periodic comet with the University of Arizona Spacewatch Telescope on Kitt Peak. It is too faint for visual observation. Interestingly the comet seems to have split and two nuclei are visible. 1996 U1 = 129P/Shoemaker-Levy 3 Has been recovered more than a year from perihelion. It is too faint for visual observation.